Metallica reissued their third album, "Master of Puppets" on their own Blackened Recordings on Nov. 10. The album has been remastered for the most advanced sound quality and is available in various digital and physical configurations. 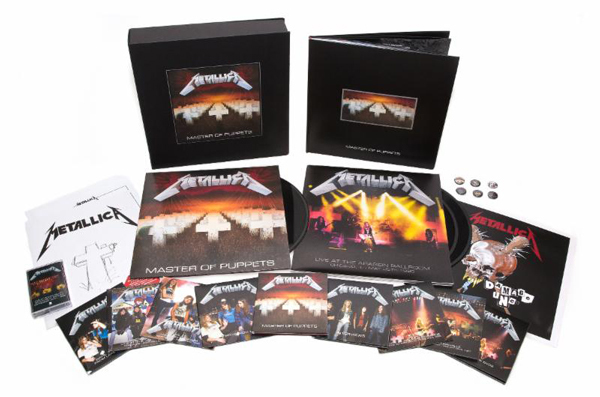 The "Master of Puppets" reissue is available physically as a Standard LP, Standard CD, 3 CD Expanded Edition, and Limited Edition Deluxe Box Set and digitally as a Standard CD (available to stream and download), a 3 CD Expanded Edition (available for download only) and a Digital Deluxe Box Set (available for streaming and download). The Expanded Edition includes previously unreleased demos, rough mixes, interviews, live tracks, and a 28-page booklet. The Limited Edition Deluxe Box Set includes a 108-page hardcover book including never before seen photos, outtakes and previously unreleased interviews, three LPs, ten CDs, a cassette, two DVDs, a lithograph, a folder with handwritten lyrics, and a set of six buttons. On this week's It's Electric! with Lars Ulrich on Beats 1, audiences world wide will be treated to part one of a very special two part series commemorating the reissue of Metallica's 1986 album "Master of Puppets." From Antwerp, Belgium inside the Sportpaleis arena, Lars is joined by James, Kirk and Rob to talk all things 'Master' from the first riffs recorded on fostex to James' lyrical influences and many, many more stories in between. Part 1 will air this Nov. 12 at 3pm PT and Part 2 on Nov. 19 at 3pm PT. Tune in at apple.com/beats1 and watch the teaser video HERE. The full video will go live Nov. 13 at 9:00 a.m. PST. "Master of Puppets" was originally released on March 3, 1986, on Elektra Records and went on to become the first Metallica album to be certified Platinum by the RIAA. The album has been certified 6x Platinum in the United States and has sold over 10 million copies worldwide. In 2016, the album became the first metal album to be added to the National Recording Registry of the Library of Congress, an honor granted to works deemed "culturally, historically or aesthetically significant." Metallica recently wrapped the European leg of their WorldWired tour. They headlined the Band Together Bay Area benefit at AT&T Park in San Francisco.